This is an anniversary card for my in-laws, I think it turned out well. This is the second card I made using Vellum as a large part of the card so it was a huge learning experience, I will post the first try using vellum in early Feb. I have never really liked using Vellum, when cutting the edges always have the fine while line, it is impossible to use glue without it showing through. 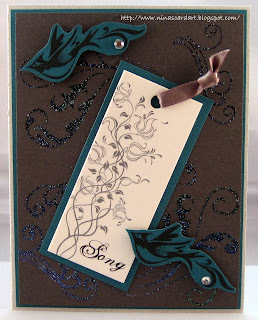 It has such an elegant look to it though that I wanted to try it again now that I am a little more versed in card making. With the first card I had it already to assemble, I looked through my cache of adhesives to see which hopefully have the least amount of impact. Much to my dismay the one I chose did not work any better than any other time I had attempted to try using Vellum. I am not sure why I did not think if it soon but I did some searching online to see if I am the only vellum novice out there.. Troubleshooting 101.. research I am good at that. So I found a couple of websites that pretty much said the same thing as I was experiencing but did offer some tips. This is what I found. Over all this worked for me, wishing I had found this info before the first card but it is all about learning. You can still see some of the glue stick residue in this card but it is a start and I won’t shy away from using Vellum anymore. I will however look for a craft glue stick the next time I venture in to my local stamp store. Another recommendation I found was that you can place the glue where it can be hidden, under embellishments or ribbons, or even not using adhesive at all those same embellishment well placed can do the same job. Something for me to try next round. I am always open to more suggestions though. This card portrait is not very good, it makes the card look a little off center but in fact everything is even. I actually took a ruler to it. *sign* I am working on it. Blog free Sunday tomorrow, have a wonderful day, I will be back Monday. P.S. Earlier this week I missed the oppurtunity to wish Valinda a Happy Birthday, so happy Belated Valinda I hope you had a fabulous day and that you were spoiled. I felt the earth move.. heheh thought you were getting something good didn't you. It was actually an earthquake, just a tiny one for an earthquake but it shook the house just the same. We live in a Zone 6 here in Victoria, I don’t think the zones get much higher than that. Hello costly Earthquake insurance. Poor Vogue she takes a hit again with me calling her names as she scratched with her earth moving paw at 5:25 this morning. This is Vogue, she is a sweet natured Geriatric princess with one eye. In her old age she feels that things such as drooling on her support staff in the middle of the night is a good way to get some food that is already in her bowl but she has seemed unworthy because she had licked it into little balls. Vogue has lost a few teeth along the way so she drools like a Saint Bernard. Cats don’t lack persistence either, round and round, meow in face, round and round drool on face, round and round sit on chest. I can hear her little brain…… day 5468 of captivity, I will drive the humans insane. This is the 'So What' look, as in 'I did nothing'. *Sign* I love my cat…. Me tired. Sorry no card today. Sorry the image is a little blurry. I seem to be doing a lot of cutting out and using dimentionals to pop items up a lot these past few weeks. I did so much cutting out of shapes at the last Stampin! Up workshop that I don’t quite dislike it as much as I did before. This card is no exception. I apologize for the horrible card portrait, it really does not do this card justice. I love this stamps set, I have used it a couple of times but I am still getting a feel for it. The center is on dimentionals to give it a 3D look. Remember that cute little baby card for a little lady I made a few weeks back… opps, Welcome Benjamin. 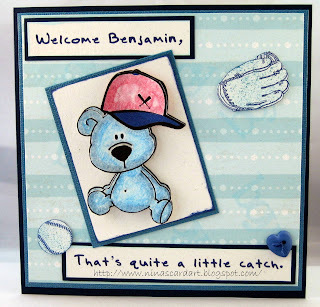 Saying Ben’s family likes baseball is putting it mildly, hence the baseball theme to this new little boy’s welcome card. I used the ball, mitt and ball cap from Microsoft Clipart. I also used Microsoft Office for the wording. You can see in this portrait that Bear is popped up with dimensional, I colored him with watercolor pencils. This was the first card that I tried PearlEx on, I wish that the portrait of this card showed the glimmer, it turned out so nice. Inside there is a cute little ox. 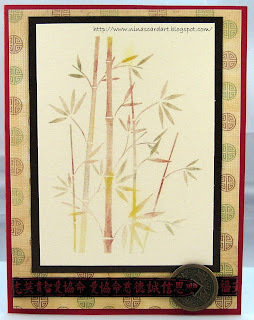 Supplies: Red and deep brown metallic cardstock, Designer Paper – DCWV The Far East Stack, Hero Arts-Decorative Bamboo, PearlEX, Misc Ribbon and Chinese Coin. I really like the Lone tree stamp, and as I was sorting through my stamps looking for something specific I pulled the Lone Tree stamp out knowing I wanted to make a card with it. I am not sure where or who it is going to go to yet but it never hurts to have a spare card or two in the wings. 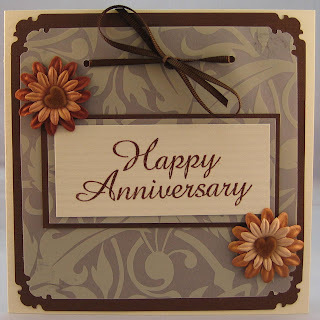 This was a pretty basic card to make, layer cardstock, stamp an image (Versafine Sepia) add a little ribbon and a couple of branches, use a little adhesive and done. I think the hardest part was working with the glue stick I used it for the branches, I felt like I was 5 and using a glue stick for the first time, I had glue everywhere. It all worked out in the end though. 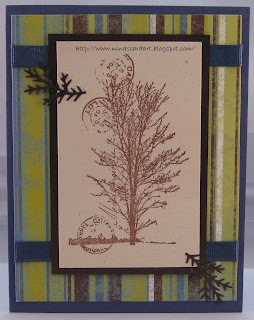 This card portrait does not show the nice deep brown metallic cardstock which is nice and shiney, I used it for the branches as well. Supplies: Blue cardstock, Deep brown Metallic cardstock, Designer paper – Bohemia My Journey, Paperbag Studios – Lone Tree, Must be ribbons, Martha Stewart Branch Craft Punch . Have a great Saturday, I am going to start no post Sundays on my blog. I will be back bright and early Monday though, well maybe not so bright but definitely early. I have been a little swamped the last little while so I have not been as faithful to some of the blogs I normally visit to leave comments, I will catch up as soon as I get a few minutes to get it together. Thank you for your patience. A sweet friend brought me this beautiful tag, I think she saved it from a new piece of clothing she brought and brought it to me thinking I could use it somehow with my cards. Well looky here, I made this card for you Lisa, I hope you like it. I really enjoyed making it and love the way it turned out. I used Versamark and embossing power to get the wonderful iridescent look on the dark gray cardstock. Although it does not show very well in this image, you can get a peek in the lower left of the card. Supplies: Bazzill Cardstock – Calypso Blue, speckled gray and dark gray cardstock – unknown, Stampology- Flourishes V2, Clear Stamps – Birds Galore, Kaleidoscope Transparent embossing powder, Forever in Time Pop Dots, Unknown clothing tag, Offray My Moments Petite Gems. 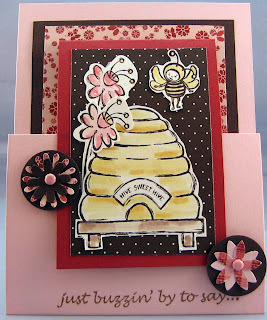 This card from the Stampin’ Up workshop and was to demonstrate a masking technique, I failed miserably at what was being taught but I ended up with a similar card to everyone else. We used a chocolate chip marker and a punch to get the stitched look. We used dimensionals to make some of the flowers pop up. 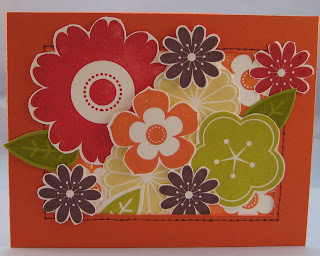 Supplies: All supplies used on this card are Stampin’ Up!, tangerine tango, kiwi kiss, whisper white cardstock, Petal Pizzaz Stamp Set, dimensionals, the following inks were used –kiwi kiss, tangerine tango, riding hood red, so saffron, chocolate chip. Ha ve a great day. 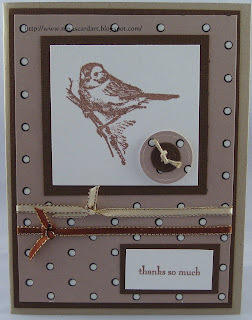 This cute little card is also from the Stampin' Up workshop. Life is insane today, so no card. Will post tomorrow. 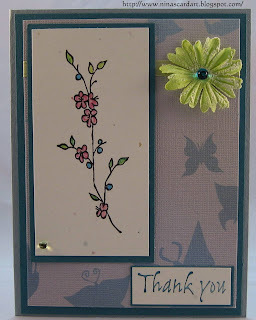 Another Stampin’ Up! workshop card. Supplies: All supplies used on this card are Stampin’ Up!, Pacific Point textured cardstock, watercolor paper, Dream a Little dream Stamp set, Purple Rhinestone, cream and blue speckled ribbon. 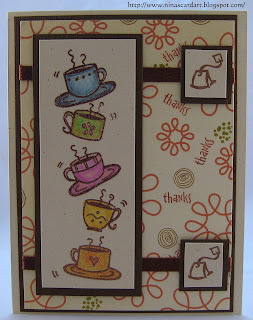 Sorry this post is so late, I went to a Stampin’ Up! workshop today and I wanted today’s card to be one that I made there. 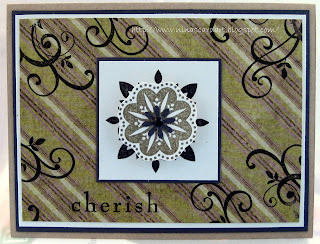 Supplies: Kiwi Kiss & white Cardstock – Stampin’ Up!, Sizzix Top Note die cut, Echoes of Kindness Stamps – Stampin’ Up, Misc Ribbon, Brown Staz-on ink. The next few posts will be projects that were created at this workshop. Sorry I took these images at night so they are not the best. It is another foggy day here, hello Saturday. It has been foggy all week, we are told by our weather guy that the sun is bright and shiny above it but we don’t see it till afternoon I am not complaining though as it is not rain or show. 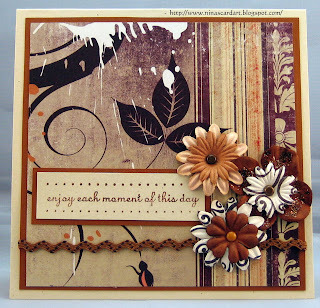 Supplies: Natural Ivory cardstock – Stampin’ Up!, brown DoubleMates cardstock, Hero Arts – Enjoy Each Moment, Prima flowers, Misc brads and ribbon, Ranger Stickles. 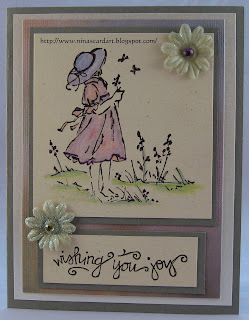 The wonderful thing about this stamp is that it is so versatile, birthday's, anniveraries or even just a everyday card. With that said.... Enjoy each moment of this day. As much as I can tweak the card portrait just does not do this card justice. The yellow and the pink are so much more subtle as is the ink that I dabbed around bear. I used my water color pencils to give bear and bee color, aren’t they just the cutest. One thing I have discover with digital printed images though is that you need to be careful so that the printer ink does not run when you use something like a blender pen or Stickles. I did not notice the ribbon of kilter until after I took this picture, I fixed it when I saw the flaw so please ignore that. Supplies: Light and medium pink cardstock, Designer Paper – Memory Stor , Digi Stamp – C.C. 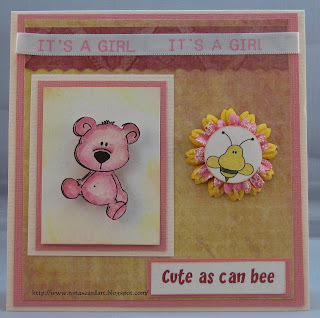 Designs – Bear Hugs- Sitting Bear, Face on Bee and cute as, misc flowers and ribbon. 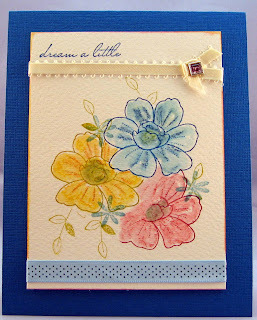 This card was made with a Digital Download stamp designed by C.C. Designs, I love it. The colors on this card portrait are not quite right. My sister would tell me the magic tips to correct it but I am working it all out, the green swirls are a little more muted in a nice way on the actual card. I doubled up on the ribbon to give it the effect I wanted. I used Microsoft Word for the Birthday wishes, I added some Stickles to the flowers and some glitter to her little wings , halo and pom poms with my Marvy Just Glitter pen. I coloured my little lady with my watercolour pencils. 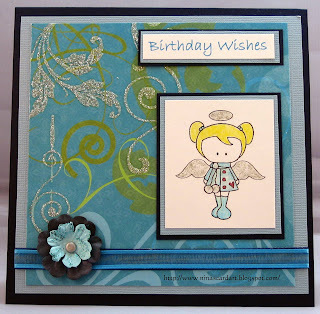 Supplies: Navy and baby Blue cardstock, Designer Paper – DCWV the All Dressed up Stack, Digi Stamp – C.C. Designs – Standing Snowbunny with wings, Forever in Time-Paper flowers, Staight ‘N’ Narrow Ribbon, misc –brad. A second post *smile* so unlike me but I need to share. 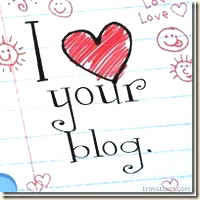 Kerry over at Three Clovers Designs is giving away great Blog Candy for her upcoming Blogoversary. Please take a moment to stop by to take a peak. What a nice surprise, I received a blog award. Not sure what to do with it just yet, as I am still so new to the blog world. I will figure it out but in stages. My Big Sister sent this my way, she is always encouraging, never fails to support her crazy sister and is beyond talented (see her blog here http://lalalime.blogspot.com/) thank you Barb. If I understand this correctly I am suppose to share 7 random tidbits about me. 1) I love Dutch licorice, it is a nasty little addiction. 2) I have no patience for girly stuff, I don’t get excited about make-up, shoes or clothing. 4) I have a fondness for chick-flicks, I love Under the Tuscan Sun and have watched it at least 20 times. This card was a random thought, it was just there in my head swirling about and needed to be made. I like it.. but it makes me tilt my head in wonder at all the wonderful swirls and twirls on the paper and bird. Odd you say, yes I agree. Most of my card start pretty basic, I like to layer, I love Spellbinders Nestabilities and I have seen them on a number of cards on random blogs I frequent but they is not yet in my arsenal (yet *grin*). Soon I say soon. So in the mean time I will continue on my merry way with what I have. I stamped my bird with brown ink, used my Marvy punches to punch out a couple different flowers to layer on top if my floral embellishments, add a little ribbon, glue and adhesive everywhere then.. done. 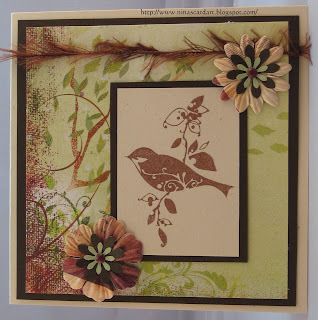 Supplies: Natural Ivory cardstock – Stampin’ Up!, brown cardstock, Designer Paper – Memory Box Provence collection, Inkadinkado-Birds Galore Clear Stamps, Prima – Floral Embellishments, Bird Feather ribbon, brads. I was able to get some cards made last night, I wanted to make cards so badly this weekend but I could not come up with one idea. I would sit for awhile and look at my supplies and sort through paper but nada. Isn’t it just the way when you have the time but…. Anyway, today’s card was not made last night it is a card that I really like how it turned out. My in-laws liked it so that is what counts. The button was made with a Sizzix sizzlets Diecut Button # 5 that I purchased from Stampin’ Up!. Looking back through my blog, I have been using alot of natural colors. Supplies: Craft cardstock-Stampin’ Up!, White and brown cardstock, Designer papers -S.E.I Charlemagne, Inkadinkado-Sparrow, Stampin’ Up-thanks so much, Celebrate it Holiday Trim-it Ribbon, Stampin’ Up!-Hemp Twine. Today’s card is very simple thank you, it really did come out looking much nicer then the photo displays. The colors blend a little better. I colored the flowers with my watercolor pencils. I love the speckled cream cardstock that I stamped on the little speckles are have a slight sparkle to them that does not show in the card portrait. Have a wonderful Monday . With today’s card I embossed the tea cups with Jo-Ann Craft Essentials copper embossing powers then colored them with my watercolor pencils. The little tea bag was stamped with brown ink. Supplies: Brown and cream cardstock, Designer Paper – Scenic Route Sumner Bonney Ave, Great Impressions – Tea Cups, Stampendous – Tea Bag, Ribbon. My sister Barb has created this fabulous card for Zach, she digitally created this masterpiece then added a guitar string and a guitar pick as embellishments. Zach loves it. Thank you Barb and Miles for spoiling Zach, he loves his gifts. Happy Saturday, HAPPY BIRTHDAY ZACH. Today is my baby’s 15th birthday, yup 15?? Not sure what happened there because I don’t recall time flying by that fast. Happy 15th little man, enjoy. For some reason this is huge birthday for my son he is pumped about it. I don’t recall 15 being a big deal for me. I do remember like all other kids wanting to grow up so fast. Zach wants to be taller, older, all things associated with getting older only he wants them now. Slow down buddy, you will get there, enjoy the ride. So today card is dedicated to my music man. Rock away and have a fabulous birthday. Supplies: Gray and black cardstock, Designer papers – S.E.I Charlemagne, Inkadinkado – RockStar Clear stamps, ribbon, ribbon slide, brads. 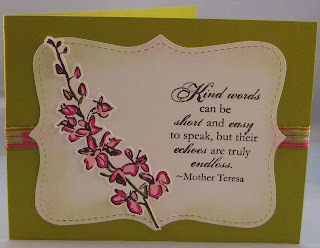 This was another famous husband request, one of those, hey it is so and so’s birthday can you make a card by tomorrow. Don’t get me wrong I am not complaining, maybe I like the challenge? When I started making this card, I was not sure if I liked it, I wanted to use the rainbow designer paper and this stamp but I was not really finding cardstock that would work with it. Once I had the image colored I was happier, then the glittery flowers just sort of pulled it together especially after I added the purple and sage rhinestones. The wishing you joy stamp was an after though but I think it was perfect. On the inside I stamped Birthday Wishes. I love the Derwent Watercolor pencils my husband brought me for Christmas, they are so nice to work with. Still getting a feel for my light tent, it casts a bit of a gray light, I am not sure if it is the way I have my lights, time and practice will tell. 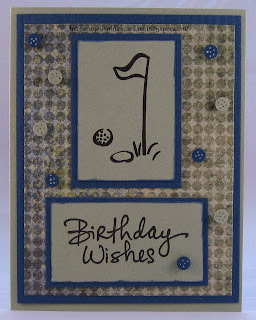 This card is for a golf enthusiast, I don’t have any stamps that come even close to golf so I had to improvise with clipart from Microsoft Word. capture the true effect of the card, it turned out half decent. Mid-week already, happy Wednesday. 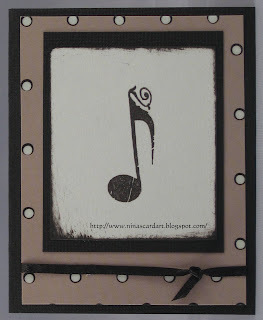 Today card is a simple, small card for my son’s music teacher. I tuck a cheque or money in a new card each month for payment. Yeah that is a lot but if I stopped now he might toss us out and it is almost a mini challenge to make something new each month that is musically inclined. 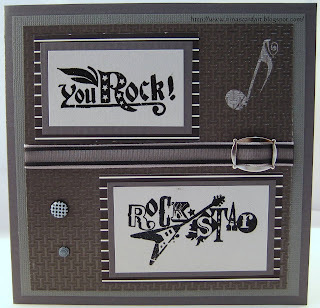 Supples: Brown card stock, Designer papers – S.E.I Charlemagne, Offray spool o’ ribbon, Inkadinkado Rock Star clear Stamps. Have a wild and wonderful Wednesday.